Synopsis: In the last pAsuram, svAmi aruLaLa perumAL emberumAnAr talked about a person who realized the true nature of a soul (jivAthma). He described him as one who knew the true nature of a soul as “always subservient to paramAthma sriman nArAyANan and no one else”. svAmi aruLaLa perumAL emberumAnAr went ahead and described the way in which a surrendered soul thinks about its true nature by giving an example as well. In this pAsruam, he describes a person who does not realize the true nature of soul. For these people, the copious influx of wealth, its decrease thereupon, ability to live a longer life or the inability to live a longer life, are all set to bring about happiness and sadness. However, for a person who has truly surrendered to paramAthma sriman nArAyANan only and no one else, there is no such fluctuations in emotions in terms of temporal happiness and sadness because of influx, outflux, longer and shorter lives. 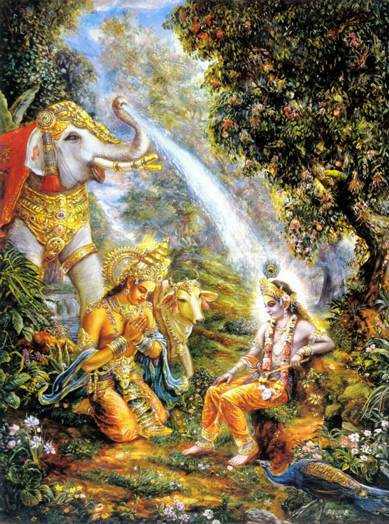 This high thought is what is being explained in this pAsuram. onRiduga viNNavar kOn selvam “selvam” refers to the copious wealth of indiran, the leader of all devAs. The wealth with which one can rule over the entire three worlds including bhU lOkam, bhuvar lOkam and suvar lOkam. 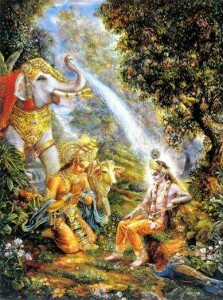 Such wealth, even when a person does not want it, can come unto him. ozhinthiduga Such wealth can get destroyed from that person in such a way that it would never be possible to earn it or get it by luck. enRum iRavAdhirunthiduga Let that person live forever without death at any point of time. kaLippum kavarvum ivaRRAl piRakkumO? Worldly people experience happiness because they either get wealth or long life. They experience sadness by the subsequent loss of wealth or lack of long life that manifests itself in sudden death. thaRReLindha pin This refers to the condition whereby one know himself, meaning, the true nature of his soul which is nothing but that the soul is eternally subservient to its eternal master sriman nArAyANan and no one else.